Crissy Field should be a top contender if you only have time to check out one coastal area during your visit to San Francisco. It's one of the most picturesque natural areas in the city. Located on the northeast side of the city and facing the inside of the bay, this National Historical Landmark is popular among both locals and tourists for it's history, gorgeous views, and range of outdoor activities. 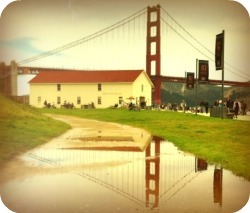 Named a National Historical Landmark in 1962, today it is also a protected Golden Gate National Recreation Area (GGNRA). The name, Crissy Field, is an honorary tribute to a pilot of the same name Major Dana H. Crissy, who died in a crash while doing a transcontinental reliability test of a de Havilland DH-4B plane. It's a tip of the hat to its history as an airfield, as well as the site of several early aviation achievements. 1920 - The final leg of the first transcontinental run landed here. 1921 - Two planes departed from Crissy Fields for the first day/night transcontinental flight. 1924 - The Air Service's "dawn to dusk" transcontinental speed flight landed here in front of a crowd of 50,000 people. Today when you walk along the gravel promenade that traverses the park, you can see the huge, old, airplane hangars that have since been restored and now house various businesses geared towards fitness and athletic activities. Crissy Field is a dream destination for folks who love the outdoors. Locals come here to walk, jog, take their dogs out for a run, bike, fly kites, or if they are into aqua sports - wind-surf, kite-surf or surf the break at Fort Point. On a hot day, this is one of the safer beaches to bring children who want to wade in the water. Since it faces the bay, the waves are usually very small. If you prefer indoor activities, you could take a visit to Planet Granite (housed in one of the restored airplane hangars) which boasts a huge climbing gym, regular gym, sauna, and full schedule of yoga and fitness classes. There are swimming lessons for kids at La Petite Baleen, gymnastics classes for kids at San Francisco Gymnastics, and Roaring Mouse Cycles, a quality-service bike shop for any kind of bicycle enthusiast. If you are not in the mood to be super active, you can have a picnic in one of the designated picnic areas, wade your toes in the gentle, lapping waves (but watch out, the water is cold! ), or just take in the lovely views of the surrounding San Francisco city skyline, Alcatraz and the Golden Gate Bridge. 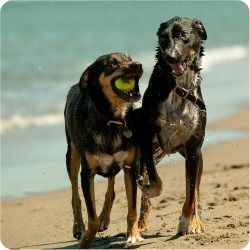 The beaches are an enormously popular place for locals to let their dogs run freely. If you come, you will undoubtedly see canines of all shapes and sizes bounding around excitedly. As of now, the unfenced areas of the central and east and beaches at Crissy Field are off-leash all year. The west beach is open to off-leash use only between the months of May though July when the endangered plovers (an adorable bird species local to the coastal areas) are not present. This may change, however, as currently there is a battle raging between the GGNRA park managers and local dog-owners over a law that would prevent dogs from being allowed to exercise off-leash. The pups in the image above are my sister's dogs getting there daily exercise on the beach. You can stop in at either the Warming Hut Bookshop and Cafe (located at the far west end of Crissy Field) or the Beach Hut (located next to the Crissy Field Center on the eastern end). Both are nice, although I enjoy the Warming Hut more. At either location you can grab a cup of hot cocoa or a savory snack, and maybe buy a cool SF souvenir to bring home for a friend. The proceeds of the gift shops go to support the Golden Gate Parks Conservancy – a non-profit organization dedicated to keeping our natural areas looking beautiful. The point on the map shows where the Warming Hut is located. There are parking lots located at either end of the park (and restrooms as well), as well as some limited street parking in between.